Another podcast, another Sunday spent painting. This time around I discuss Battlestar Galactica’s Season 2 cliffhanger and offer a brief review of the film version of V for Vendetta (yes, I’m behind the geek times) before launching into reviews of the turn-based strategy game FreeCiv, the podcasts Misfit Brew and Does My Geek Look Big in This?, talk about the venerable webzine Quantum Muse, and present reader John Mierau’s review of the “PodReady” portable podcatching client. That’s followed up by a review of Wizards of the Coast’s Spell Compendium, which includes some of my thoughts on D&D 4th Edition and a bit of a rant on the importance of indexes. Lastly, I put out a call for news of new science fiction-themed podcasts as well as podcasts and blogs by geek moms and dads. 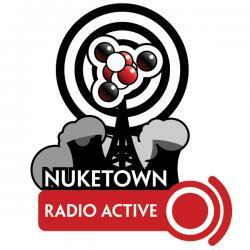 If you’ve come across any of these, let me know by sending an email to nuketown@gmail.com. Painting, Painting, and More Painting: A late night recording of Radio Active: spent the day (once again) painting Jordan’s room and furniture. Discovered that the lavender we wanted to paint her room was really more of a purple-tinted white, so we’re going to use that paint for the trim and buy a darker shade of purple. Battlestar Galactica: All caught up on Battlestar Galactica Season 2 and … wow, what a freaking ending! (spoiler alert — if you haven’t seen it, skip ahead) I sincerely hope they don’t pull an Alias by jumping ahead a full year (Alias jumped ahead two years once, destroying most of Sidney’s supporting cast and seriously derailing the series). But they seem to know what they’re doing with this, and the jump makes sense from a story stand point. Who’d really want to spend a year watching them eek out a living on the planet? Civilization II is one of the best games of all time. Turn-based strategy at perhaps its very best — none of the sequels could compare. Now a group of fans has created something that does compare: FreeCiv, an open-source game heavily inspired by Civ2 that runs on Windows, Linux and Mac. Incorporates online play and more Civs than you can shake a thermonuclear warhead at. Haven’t gotten very far in it yet, but so far its already better than Civ III. Check it out … but remember how much time you lost playing the original. Commentary and essays about geekdom and gaming. I’ve listened to shows #8 and #9, and loved both of ’em. It’s produced more like an like an audio magazine than a podcast (and by that I mean it was well produced, with more of the essays and less of the ramblings). Excellent to be down in my basement, paint smeared across my face as I struggle with getting a first coat of primer of my daughter’s soon-to-be dresser, while listening to a reasoned conversation about the archtype of the Magician and other essays on the power of myth. Makes me think I should work on putting together something similar for science fiction — I’d enjoy a half-hour of people discussing science fiction themes, ideas and archtypes. A British couple talking beer and gaming (usually in that order). Great fun to listen to, partly because they have a blast testing the beer, partly because their gaming interests align with mine and mostly because they’ve just got a darn good show. The long-running Quantum Muse webzine — which features a bunch of new scifi, fantasy and horror stories each month — now has a news section. Read genre news or submit news of your own. Contains spells from all of the “Complete” books, Libris Mortis, and a bunch of Dragon Magazines. Some have been updated/clarified, and all now have flavor text describing exactly what happens when you cast each spell (how components are used, what hand motions are involved, etc. Useful for anyone who’s using these spells, doesn’t want to carry the books around. Also good for anyone doesn’t have the books, but plays with people who do — if you want the spells, why not just buy one book rather than a half dozen? Surely a sign of the infopolypse proceeding D&D 4.0. The appearance of such a compilation book, IMHO, heralds a D&D 4.0 announcement this year, with the new edition in 2007. But hopefully I’m wrong. Useful … but not useful enough. Ditch the flavor text and give me an index. Any book without an index instantly loses 1 rating point! Give me spell lists by element, school and any other combo you can imagine. Don’t send me to the web, include it in the book! Note when and where the spell first appeared, so I know what book’s been superseded. Fight the 2E effect, don’t embrace it! Next on Radio Active: A review of Stephen King’s Cell, which I also listened to while painting Jordan’s room. Looking for more pure science fiction themed podcasts. Also looking for blogs and podcasts by geek moms and dads. Know of one? E-mail me about it.